SkinCeuticals serums are concentrated formulations designed to help prevent and correct the appearance of specific skin concerns and conditions. With options that have been clinically proven to improve the look of concerns such as discoloration, wrinkles, acne, and more, our potent face serums are essential for achieving healthy looking skin. By definition, serums are a type of skin care formulation that are applied after cleansing and before moisturizing to target specific skin care concerns. Generally lightweight and fast-absorbing with a liquid-based texture, skin care serums can help amplify the results of any at-home skin care product regimen. What is a serum most often used for? Serums are usually formulated with a specific skin concern or condition in mind, and are designed to be used in conjunction with other skin care products to optimize results. Some common uses for serums include improving the appearance of discoloration, wrinkles, acne, excess oil, redness, or rough surface texture. redness are an important and effective way to provide the skin with antioxidants to help prevent environmental damage, while hyaluronic acid serums are used to enhance skin hydration in all skin types. There are also serums that combine multiple ingredients to provide improvement for specific combinations of concerns (such as acne and visible signs of aging) as well as comprehensive anti-aging benefits. Serums can also be formulated for specific areas of the face, such as around the eyes or for the lips. What is the difference between a serum and a cream or lotion? The ideal serums for moisturizers are two different types of skin care formulations, and the key distinction is when they are applied. Serums should be applied before lotion or cream, or they can be used in place of a moisturizer if the serum is formulated with hydrating ingredients. Our Hydrating B5 serum can play the role of both since it provides the skin with essential moisture on its own; however, those with drier skin may choose to layer it beneath a hydrating lotion or cream. 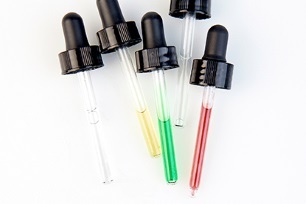 In many cases, a serum contains ingredients that target a particular skin concern. What serums are best for dry skin? The ideal serums for dry skin contain ingredients that provide the skin with much-needed hydration. Hyaluronic acid serums are amongst the most effective, since this natural sugar is capable of holding up to 1,000 times its weight in water, as well as drawing moisture from the environment into the skin. This ingredient can be found in serums formulated specifically for replenishing skin moisture, such as Hydrating B5, and maintaining skin hydration levels, such as H.A. Intensifier. Hyaluronic Acid can also be used in multipurpose products that address discoloration, redness, sensitivity, and rough surface texture. If you have dry skin, it’s best to consult with a SkinCeuticals skincare professional who can recommend the ideal serum for your skin’s unique needs. Can I use a serum if I have oily skin? SkinCeuticals offers serums formulated for specific skin concerns, as well as serums that are appropriate for all skin types. The key to finding the ideal serum when you have oily skin is looking at the ingredients. For example, Hydrating B5 is an ultra-lightweight, oil-free serum formulated with hyaluronic acid to provide the skin with essential moisture without a thick or heavy feel. This particular serum can be used by those with oily skin in place of a moisturizer. In cases of oily skin prone to acne, Blemish + Age Defense serum targets acne as well as visible signs of aging in one potent formulation. To discover the best serum for your oily skin, schedule an appointment with a SkinCeuticals skincare professional. What is the best vitamin C serum for my skin? A daily vitamin C antioxidant serum is essential for protecting the skin from environmental aggressors beyond the UV rays that sunscreens intercept. The first step when shopping for vitamin C serums is ensuring the formula meets three specific criteria. First, the product must be formulated with pure vitamin C (l-ascorbic acid). Second, vitamin C must be at an ideal concentration of 10-20%. Lastly, vitamin C serums must be formulated at an acidic pH equal to or lower than 3.5 for maximum absorption into the skin. SkinCeuticals offers vitamin C serums for a variety of skin concerns and skin types. C E Ferulic is formulated to combat fine lines and wrinkles and is also ideal for normal-to-dry skin. Phloretin CF beyond the UV rays that sunscreens intercept. The first step when shopping for vitamin C serums is ensuring the formula meets three specific criteria. First, the product must be formulated with pure vitamin C (l-ascorbic acid). Second, vitamin C must be at an ideal concentration of 10-20%. Lastly, vitamin C serums must be formulated at an acidic pH equal to or lower than 3.5 for maximum absorption into the skin.Serum 10 is ideal for first-time users and those with sensitive skin. A SkinCeuticals skincare professional. can recommend the best vitamin C serum for your unique skin type and concern. What is the best hyaluronic acid serum? Hyaluronic acid is an ideal hydrating ingredient for all skin types, and it can be found in a variety of SkinCeuticals serums formulated for different skin concerns. H.A. Intensifier features this ingredient to help replenish moisture, along with Proxylane ™ to promote the feeling of firm, plump, smooth skin that continues to improve with ongoing use. SkinCeuticals has also developed hyaluronic acid serums that incorporate this ingredient to deliver moisture while calming sensitive skin, such as Phyto CorrectiveH.A. Intensifier features this ingredient to help replenish moisture, along with Proxylane ™ to promote the feeling of firm, plump, smooth skin that continues to improve with ongoing use. Can I use more than one serum? Yes—and you should! Vitamin C antioxidant serums are an integral part of every morning skin care regimen to protect the skin against environmental damage, and the addition of targeted serums can help address specific concerns ranging from visible signs of aging to acne and more. Combining serums that contain ingredients that work together is the ideal way to restore a more youthful appearance and achieve healthy-looking skin. When you have a variety of serums on hand, you can customize your skin care regimen to meet your skin’s particular needs at any given time. Speak with your skincare professional to customize your skin care regimen.